A special guided car service allows your passengers to travel in their own private limousine to/from the private aircraft directly, guided by a follow-me car. We would be pleased to arrange appropriate limousines and armoured cars. Just ask. Kurz Aviation Service is offering an exclusive VIP-Sercice, designed for passengers travelling on private or scheduled flights to/from Stuttgart. While you relax in our VIP-Lounge specially set up for you, we check-in your baggage and prepare your boarding pass. You proceed through security and passport control in our exclusive terminal and of course transfer will be by private VIP-limousine to the aircraft directly. A perfect, discrete and comfortable way of traveling. Our VIP Service requires a booking of at least 24 hours prior to departure. Please kindly provide us travel details as requested in our online booking form. 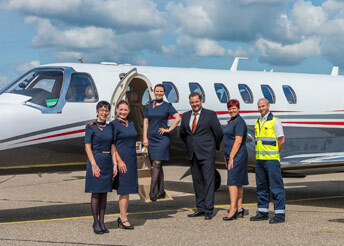 After positive answer from the airline we will confirm the service to you by e-mai. We look forward to welcoming you at our General Aviation Terminal Stuttgart. Please download form and send it to us by e-mail or fax.